Phrazzled – Theatre Review | That's So Rad! There is another world behind the scenes of your favorite television show. There are the writers, the writer’s personal assistants and then there are the assistants to those assistants. It is in this place, the room adjacent to a TV Production’s writers’ room, that a writer’s satire meets Alice through the looking glass is brought to life. 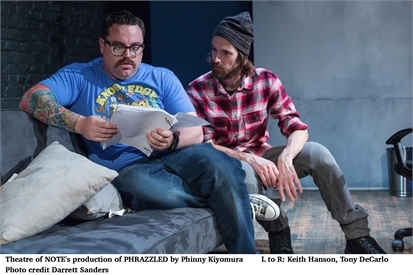 Phrazzled, written and directed by Phinneas Kiyomura, tells the story of Phraz (Tony DeCarlo), an angry guy with an aggressive hatred toward his boss, Whisk (Gina Garcia-Sharp). He also works with Barney (Keith Hanson) who, like Phraz, is trying to “write his way” into the writers’ room and out of the assistants room filled with menial tasks and empty page just waiting for the next big thing. Phraz finds frustration not only in being asked to do ridiculous tasks like turning a television console into a birdcage but also in the extra friendly relationship between Barney and Whisk. The only solace that Phraz finds is in former co-worker, Travis (Will McFadden), who has garnered the interest of the Geffen with a project the two created together. Through the looking glass, Frasz (Troy Blendell), works in the same room adjacent to a TV Production’s writers’ room with Betty (Andrea Ruth) and his boss Spur (Sierra Marcks). Much like Phraz, he is trying to get out of the assistant game with a project that he has been working on with former co-worker Travis and bounces ideas, hopes, and wishes with his co-worker. Unlike Phraz, he is soft and kind and actually loves his boss, maybe a little too much though. 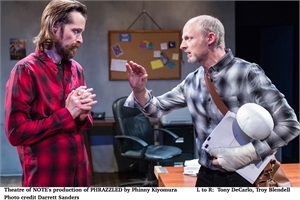 The story continually shifts between Phraz’s story and Frasz’s story with clever entrances and exits through the wall under the desk or around the back or the front of the theatre and clever use of lighting. Each version of the story has parallel emotions, story lines and arcs. One is filled with love and hope and another is filled with angst and greed but are they just two similar beings occupying a similar space in the universe or is one of them writing the story and controlling their fate? Much like many in Hollywood, Phraz and Frasc are simply trying to battle their inner feelings and outer environments in an attempt to become their own defined success as a writer, even if it is for a television show that they would never watch on their own time. 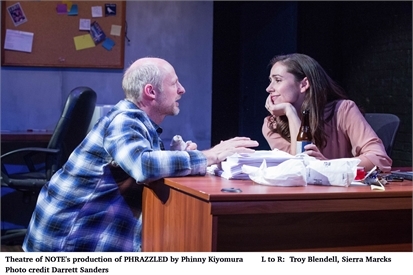 Phrazzled is smart and witty with an equal amount of laughter and deep self-reflective thought provoking moments that will leave the audience wanting to gaze into their own looking glass and wonder if they are writing their own destiny or if someone else is writing it for them. ← MTV’s Suspect – Why Can’t Humans Communicate?